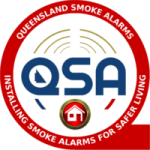 New smoke alarm legislation in Queensland. Don’t wait. Live safe now. We aim to comply properties with brand new Queensland legislation, so that Queensland families can LIVE SAFE. New state-based legislation requires the following additional measures in Queensland properties by 2027. Every bedroom in a home must have a smoke alarm. Hallways and/or adjacent areas off bedrooms also must have a smoke alarm. The alarms must be photoelectric rather than ionisation, and they must be powered by 240v or 10 year lithium batteries. All smoke alarms must meet new Australia Standard 3786:2014. 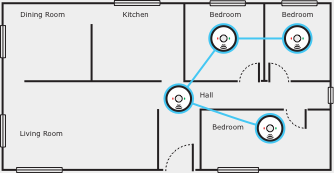 All smoke alarms must interconnect with each other. Every level of the house with a bedroom must have at least one smoke alarm installed in it’s exit path. May affect your home insurance policy. In order for us to provide you with an accurate quote to ensure your property meets the strict new legislation, it is best to book your property in for a free appraisal with one of our Accredited Master Electricians. If a smoke alarm does not work when test it must be replaced immediately. Must be replaced by photoelectric hardwired smoke alarms. Must be powered by a non-removable 10-year battery. Must be replaced with photoelectric smoke alarms. All new or substantially renovated dwellings must comply immediately to the new laws. 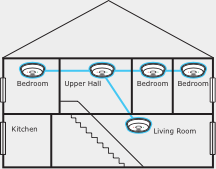 To get everyone out safely during a house fire, it is essential to also have a well-practiced fire escape plan. We will ensure that you comply. When it is time for your alarms to be upgraded those alarms must meet the following criteria. As well as comply with Australian Standard 3786-2014. They must not contain this sensor type. All alarms must be less that 10 years old. All alarms must operate when tested. All alarms must be connected so that they all activate together by the required compliance date. Must be photoelectric and comply with Australian Standard 3786-2014. These must be replaced with hardwired photoelectric alarms. In existing dwellings it is ok to have a combination of both photoelectric alarms types as long as the battery is powered by a non-removable 10 year lithium battery. Smoke alarms that comply with the Standard AS 3786-2014 and have the above labels. Don’t wait until cut off.